Intimacy happens outside the bedroom long before it happens in the bedroom. Maybe your marriage lacks a little of the spark you had when you were first married. If so, here are 4 ways to begin rebuilding, or increasing intimacy. I remember being at the airport. A young couple caught my eye. They were buried in each other in a warm embrace. As they pulled back, they gazed into each others eyes. They were too far for me to hear what was said. Tears flowed down both of their faces. He stood there in a t-shirt, shorts and flip flops, helpless. She, in the same apparel, looked down, her hair fell, and covered her sadness. She let her hands fall from his side. Taking a deep breath to compose herself, she grabbed the handle of her carry-on and adjusted her back pack. He stood there. She began to move away backwards from him and turned to go. After about 2 steps, she abandoned her small wheeled suitcase and flew back into his arms. He welcomed her embrace. She disappeared into his neck and he in her hair. They breathed together. He is the first to pull away this time. He says something inaudible. Another wave of tears flow down her cheeks. Slowly she turns to leave again. She meets up with her abandoned bag and turns toward him just before getting on the escalator. He has not moved, his gaze has not left her. She disappears before his eyes. By this time, silent tears are rolling down my face. Embarrassingly, I look around. No one else, as far as I can tell, has noticed this tender moment, or that I am falling apart. He stands there, unable to move his feet. His backpack and boarding pass indicate he will be on a different plane. He looks down for a second and in almost the same instant something catches both of our eyes. His young lady is running up the opposite escalator as fast as she can. Her backpack is swaying and her carry-on slows her down. He sprints to her and they meet each other in a passionate embrace again. It was as if time stopped for them. His beloved has returned. Do you remember when your relationship was first like this? Have you always wanted your relationship to be like this but it isn’t? 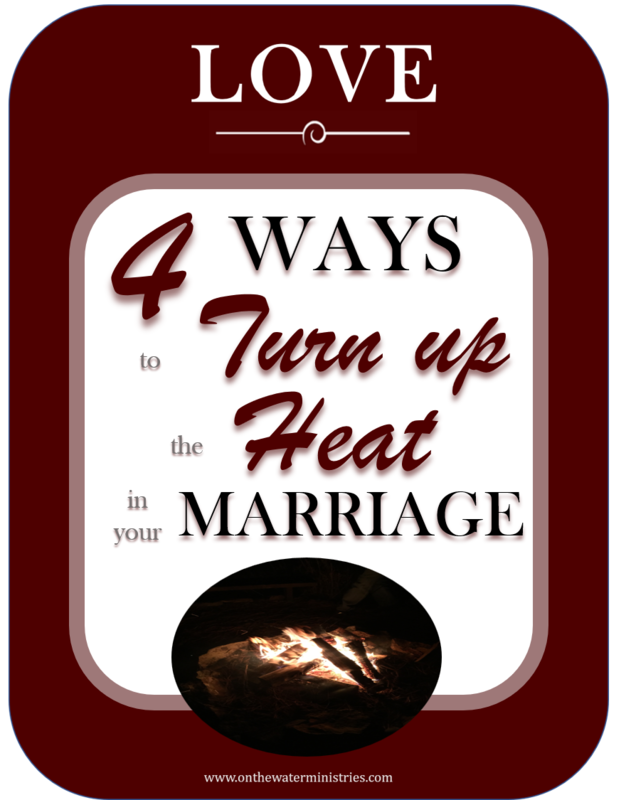 How can we turn up the heat in our marriage? I started to think about this word and what it means. All my ideas were shattered as I began to dig deeper. Beloved means long and yearn. Beloved means proud of and adore. Beloved means giving over our bodies gladly and exclusively committed. Beloved means love that is heated passion and intimacy. Let him/her know you are thinking of them with contact throughout the day. A text, a call, or an unobtrusive visit with no other purpose than to let them know you love them and are thinking of them. Even when we do not feel like it or want to, this is honoring to our spouse. In addition, it will also help protect our marriage from outside intrusion from other people if we remain close intimately. Simple words of appreciation for hard work go along way. Compliment each other often throughout the day. Remember what it was like in the beginning. Recall the things you used to do that made the relationship exciting and revisit those. Take time for a longer physical embrace than we do now. Now, intimacy was a thing of the past in my marriage a few years back. The distance between us was so great neither of us thought our marriage could be different. The damage was done. The hurt was too great. The love was gone. Or so we thought. What our marriage needed was work. EFFORT. TIME. and an abundance of grace and true forgiveness. These methods work! They can save your marriage with focus, determination and commitment. Let me encourage you: your marriage will get better in time. New habits will form and next thing you know, it will be part of your very nature. You got this! RECAP: Let your spouse know of your longing for them. Give yourself over to your spouse sexually often. Show your spouse you adore and value them. Love with passion. What is the first thing that comes to mind to do to address one of the four ways to turn up the heat? Know someone this may help? Please share! What do you each believe to be the biggest threat to your marriage right now? What is it about that threat that concerns each of you? What do you each believe is the best way to address this together? What should each of you do to ensure this does not impact your relationship? What is the biggest struggle you each are having with your spouse/relationship? What is the reason for this struggle from your persepective? What do you each believe to be the resolution to this struggle? What would you each need to do on your part to overcome this struggle? What are you each most afraid of in your lives right now? What do you think caused this struggle or would cause this struggle? What would be the best way to overcome this struggle? What should each of you do to ensure this does not become a reality? These types of questions can be uncomfortable and cause unfavorable reactions. Before you begin, commit to being honest without repercussions. Commit to sticking it through until both of you have shared and been heard. PM ME if you and your spouse need some help getting through these questions together. We have been there myself and am here to help. Apply these 4 keys and begin securing your marriage. (check spam and add “nicole@onthewaterministries.com” to your inbox so you don’t miss a thing). More of what to expect here: 3 Elements to watch for + YOUR FIRST ACTION PLAN! ⟵3 Elements to watch for + YOUR FIRST ACTION PLAN!